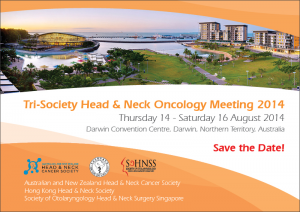 There is no doubt that scientific meetings are one of the most important activities organised by the ANZHNCS. These meetings are valuable opportunities to stay up to date with the latest learning from both local and international experience. They can also be a source of inspiration and help re-energise our efforts in preventing and treating head and neck cancers. 13 – 14 April 2018, 8:30am – 4pm. Abstract submission is now open and the deadline is 14 November 2016. Ms Amanda Dear , Head & Neck Clinical Nurse Specialist at Northern Head & Neck Cancer Institute, Freemantle Hospital, Newcastle upon Tyne, England. This post is supported by Macmillan Cancer Support. Anil K. D’Cruz MS, DNB, FRCS, Director at the Tata Memorial Hospital, Mumbai, India as well as Professor & Surgeon , Department of Head & Neck Surgery. In recognition of his professional standing in the field of surgery and oncology, he was awarded the Honorary FRCS from the Royal College of Surgeons London. Associate Professor Harry Quon, Associate Professor in Department of Radiation Oncology and Molecular Radiation Sciences with secondary appointments in the Department(s) of Otololaryngology-Head and Neck Surgery and Oncology at the Johns Hopkins University in the Sidney Kimmel Comprehensive Cancer Center in Baltimore, MD. Abstract Submissions have now closed. Authors will be notified of the outcome of their submission on Wednesday 19 June 2013. Details on Grants, Awards and Prizes available for this ASM! This grant is awarded to a doctor from a developing nation with an interest in head and neck cancer. The applicant is required to submit an abstract to be assessed and accepted for presentation at the ASM. A further requirement is for the award recipient to provide a report after the conclusion of the ASM outlining a summary of the contribution this award has made to their professional and/or personal lives. this will then be sent on to the Grants Subcommittee for final approval. On completion of the visit the successful applicant will be required to provide a report on their experience to the Grants Subcommittee. This grant is awarded to an allied health professional who successfully submits an abstract for presentation at the ASM and has requested to be considered for the grant. Only one such Grant will be awarded each ASM. To raise the profile of the ANZHNCS Research Foundation, the Foundation has kindly offered a prize for “Best Research Paper” at the ASM. This prize will be presented by the Chair of the ANZHNCS Research Foundation, Associate Professor Gary Morgan, during the ASM.